Learn how to workaround the SSH passphrase issue when you clone a remote Git repository in Dreamweaver CC. Dreamweaver does not support SSH keys with passphrase. 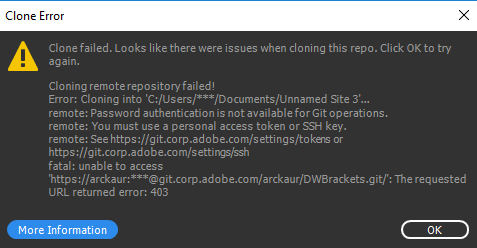 If you go ahead and clone a Git repository, you see the cloning error. Open the command line interface, and generate SSH keys using passphrase. To know how to work with SSH keys in Git, see Connecting to Git with SSH. However, if you use passphrase to generate the SSH keys using CLI, you cannot perform Git Pull or Git Push, or remote repository operations using the user interface. If you attempt to perform these operations, the system displays error messages. Whenever you point to an enterprise remote repository, you cannot connect using https. If you use https, the system displays the following error message. As a workaround, use an SSH URL when you point to an enterprise remote repository. Passphrase is not supported when you generate SSH keys for cloning a Git repository.